After the first State House was destroyed by fire in 1831, the North Carolina General Assembly ordered that a new Capitol be constructed on Union Square. The project was ultimately awarded to Town and Davis of New York City, the nation’s most prestigious architectural firm. Today, the State Capitol is widely regarded as one of its finest achievements. The General Assembly convened in its chambers until 1963. Today, the Governor and staff continue to occupy offices on the first floor, and the building is open to the public. The gallery on the second floor of the rotunda, the East and West assembly halls and the impeccably-restored library in the upper observatory are a treat to encounter. Situated between Hillsborough St. and Cameron Village, Cameron Park is a delightful snapshot of life in one of Raleigh’s first early-twentieth-century “suburban” neighborhoods. Cameron Park features beautiful homes designed on a grand scale for their period, including Queen Anne, Colonial and Mission Revivals. Narrow streets curve around central green spaces, well-worn service alleys cut between houses and colossal oaks spread their canopies above. A walk through Cameron Park is a relaxing way to see one of the city’s most genteel and historic residential enclaves. 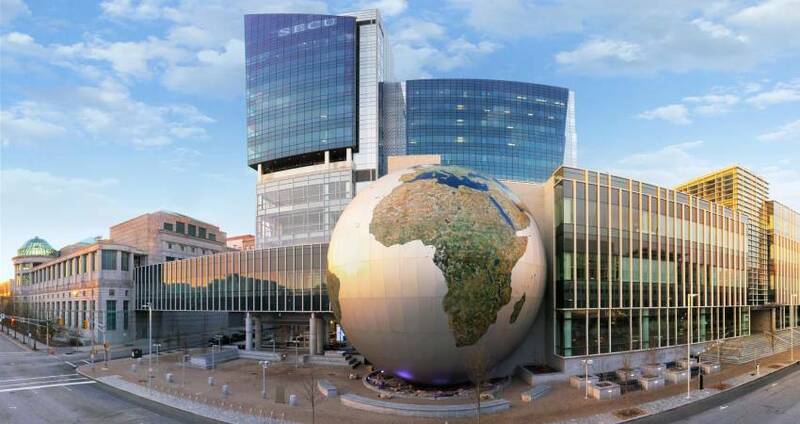 Our state’s most visited museum, the North Carolina Museum of Natural Sciences is the largest institution of its kind in the Southeast. The collection dates back to 1879, reflecting N.C.’s diverse natural habitats from the age of the dinosaurs to the present. A 10,000-gallon aquarium replicates the seafloor off the N.C. coast. A virtual ride in a submersible takes you thousands of feet below the ocean. In the Naturalist Center, you can handle rare specimens and artifacts that are usually behind glass or locked away, including real bones, furs and fossils. And through Mar. 27, 2016, explore the diversity of mammals, examining the ancestry and evolution of the biggest, smallest and most amazing mammals that have walked the Earth at the Extreme Mammals exhibit. Permanent exhibits at the history museum include the award-winning exhibition The Story of North Carolina, the North Carolina Sports Hall of Fame, an overview of N.C.&apos;s military heritage and more. Through July 2016 explore Billy Graham&apos;s life and a ministry that spanned several decades and included the Civil Rights movement and the Cold War through memorabilia, audio and video displays and interactive galleries at the N.C.&apos;s Favorite Son: Billy Graham and His Remarkable Journey of Faith exhibition. So much more than an award-winning steakhouse and banquet hall, the Angus Barn is an emblem of N.C. hospitality and the proud legacy of one of the state’s most notable families. Together with partner Charles Winston, Thad Eure, Jr., the son of N.C. Secretary of State Thad Eure, opened the Angus Barn in 1960. Especially at holiday time, when the big red barn and its many rooms are decked out in old-fashioned Christmas style, this is a welcoming, rustic retreat. Known for the cuisine of Chef Walter Royal, the restaurant boasts a renowned underground wine cellar. Venture upstairs to the classic Wild Turkey Lounge for an intimate, clubby atmosphere. With a fun, family-friendly atmosphere attracting tens of thousands of shoppers every weekend, the Raleigh Flea Market at the historic North Carolina State Fairgrounds has been an area tradition since 1971. The flea market is one of Raleigh’s top year-round tourist destinations, annually drawing 2.4 million visitors looking for treasures from more than 600 vendors who set up every Sat. and Sun., rain or shine. This is the largest selection of antiques, jewelry, furniture and collectibles in N.C.
Pullen Park, founded by Richard Stanhope Pullen in 1887, was the first public park in No.C. and is regarded as the fifth oldest operating amusement park in the U.S. The crown jewel of the 66-acre park is the circa-1900, hand-carved carrousel that is listed on the National Register of Historic Places. Also to the delight of children of all ages, a 1/3 scale locomotive train circumnavigates the park perimeter, giving rides during all hours of operation. There are antique wooden kiddie boats, pedal-powered paddle boats on the pond and playground amenities. Pullen Park has been part of the collective childhood memories for area residents and visitors for nearly 130 years.